Estacada will soon be home of the world premiere of two plays. Estacada High School students will present "Between the Lines," written by senior Ciara Schwimmer, and "Antisocial" by Don Zolidis. Performances are scheduled for 7 p.m. April 26-28, at the Estacada Auditorium, 500 N.E Main St. The upcoming performances in Estacada will be the first production for both plays. "Between the Lines" is a drama, and "Antisocial" is a comedy. Estacada High School theater teacher Autumn Gonzales said "Antisocial" pairs well with Schwimmer's work. "(Antisocial is) kind of fluffy, and a good complement," she said. "We wanted to give Ciara the lion's share. We're so proud." "Between the Lines" follows Evelyn (Kamryn Tenbush), a student at the dilapidated Easton High School. She and her best friend Sydney (Alicia James) are outcasts, while Paige (Brenna Pierce), Liam (Eric Sohnrey) and Andrew (Dylan Darity) are the most popular students in school. When Evelyn dreams up Weston High School, a place that is everything Easton High School isn't, she must come to terms with her social status being switched. 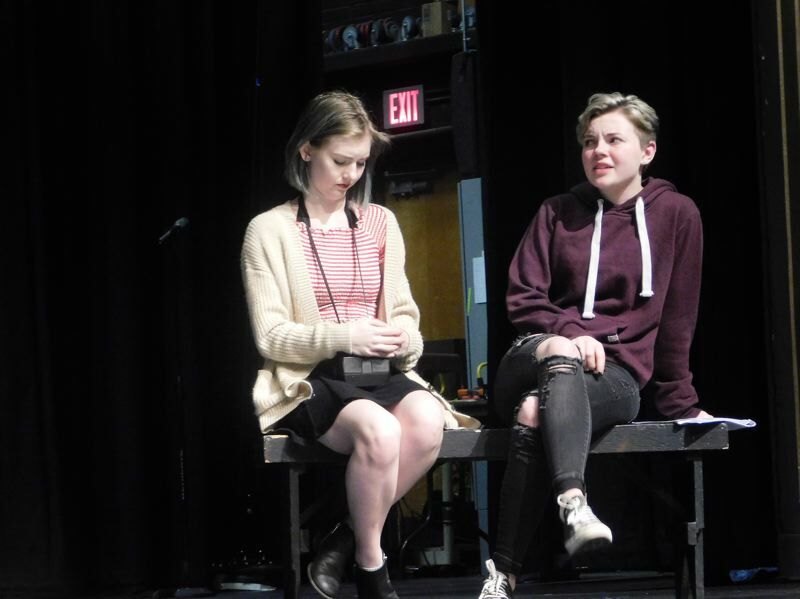 "I knew I wanted to write something at a high school with modern issues," Schwimmer said, citing judgment as one of the play's biggest themes. Schwimmer's cast appreciates what she's written — particularly the characters. "All of these characters are really real. There's no sugar coating," Tenbush said. "Every single character has some meaning behind them." "Everyone has their own issues that they deal with. Everyone has something going on," added Sohnrey. Gonzales praised the multifaceted elements of the story and characters in "Between the Lines." "I like how (Ciara is) trying to show both sides," Gonzales said. "There are different perceptions. Just because someone's not engaged with you doesn't necessarily mean they're being mean to you." Meanwhile, "Antisocial" is a series of scenes pertaining to social media. A loyal MySpace user (Max Houk) watches in horror as a janitor (Jennifer Walters) removes abandoned accounts, a couple (Alleah Schwab and Michael Swenson) hires an Instagram coach (Raven Procknow) for their daughter (Lily Belcher-McCoy), a YouTuber (Erick Olsen) uses questionable motives to achieve fame and a Twitter user (Reagan Shleich) just wants more followers. "It's about social media and how it's taken over our lives," Gonzales said. "It's kind of funny. We all do it."